Telangana Southern Power Distribution Company Limited or TSSPDCL for short has been formed after division of the State of Andhra Pradesh and has been carved out of Andhra Pradesh Central Power Distribution Company Limited. TSSPDCL provides it services in 5 districts which are Hyderabad, Nalgonda, Mahboobnagar, Ranga Reddy and Medak. It serves over 80 lac customers in these districts. TSSPDCL is headquartered at Hyderabad. The areas served can be seen in the map below. 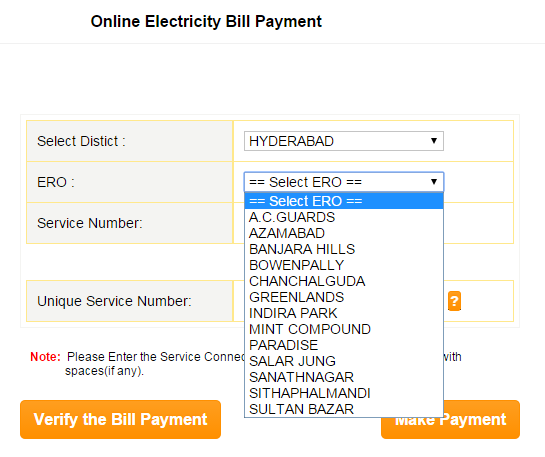 You can make payment of your electricity bill online. At the time of writing this article you can make payment through Credit Card, Netbanking and Debit Card. TSSPDCL is associated with 3 Internet Payment Service providers, they are Billdesk, PayUmoney and Citrus. They all provide the option of making payment through Credit Card, Debit Card and Netbanking with the following transaction charges applicable on each of the options. For any payment of electricity bill above Rs. 270, Netbanking is the cheapest method of making the payment. To make the payment through any of the above visit https://www.tssouthernpower.com and click on Pay you Bill. Next page will then give you the 3 options through which you can make payment as shown below. 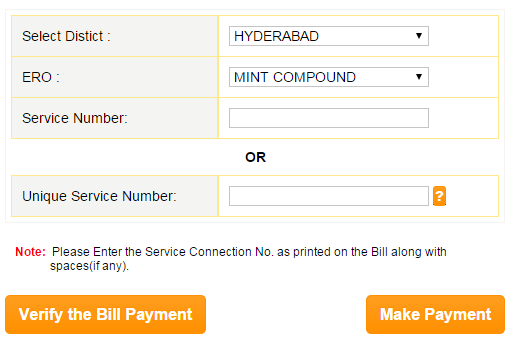 You need to ready with your District, Area Name and Service Number or Unique Service Number to initiate the payment. This information will be asked as shown below. Service Number or Unique Service Number will asked as and can be found as shown below. Enter the service number and click Make Payment to proceed ahead. I hope this article helps you in making payment of the electricity bill successfully. Do revert back with your experience in the comments section below.